It seemed like a pretty simple question, but climbing it was only half the battle. Not that Alyx and I had been to many mountains before (I once went to up a cable lift to the top of Mt Stanserhorn in Switzerland), we thought it was a nice enough day for a little adventure up to a popular hiking destination. We would hike this mountain then come back and make a nice Easter dinner, since it was Easter Sunday. Cheonggyesan Mountain straddles the border between Seoul and Anyang, and is one of the taller mountains nearby at 500+ metres. It was well reviewed and we had plenty of online info to get us there. It wasn’t far away but taking a taxi there and back could have added up. So we relied on public transit once again (which is continually proving itself to be amazingly efficient here!). A shuttle bus ran hourly from a nearby subway station – this was our first time on the bus. 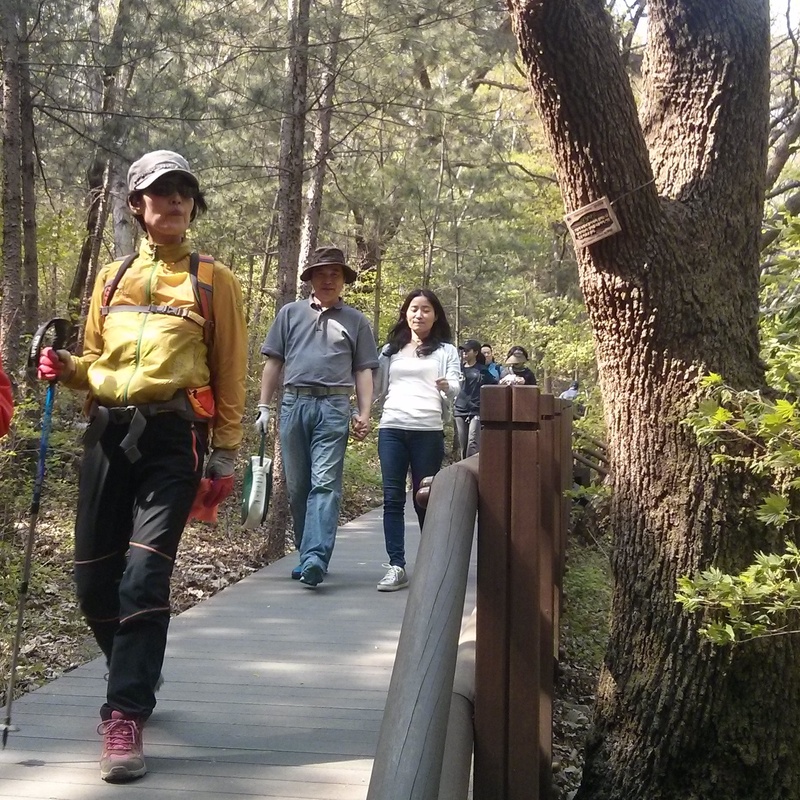 Thankfully hikers in Korea cover themselves in hiking gear so it was easy to know if we were going the right way. Hikers here almost go over the top in preperation. Many of them have jackets, hats, sunglasses, sport pants, backpacks, and walking sticks. The picture below shows you the kind of signals we watched for to go the right direction. Oh how the hiker has become the trail marker. We looked like amateurs compared to most hikers we saw near the top of the mountain. 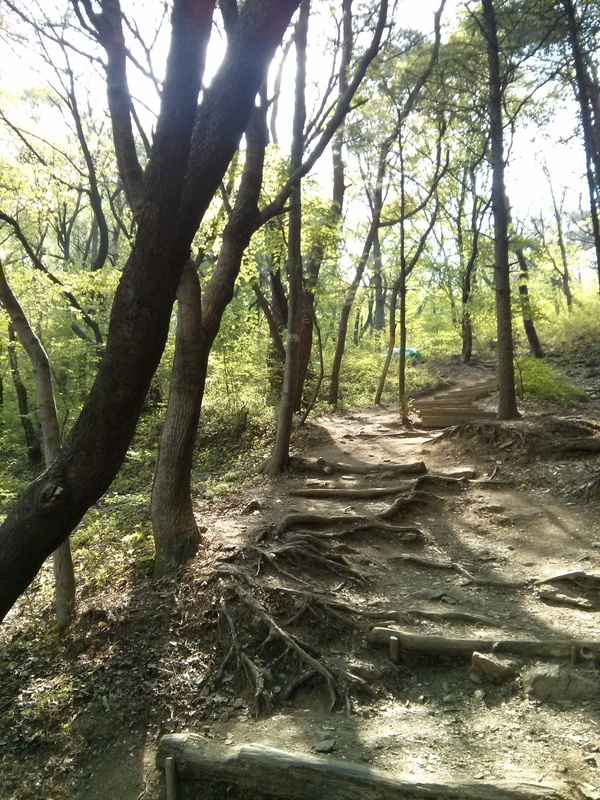 The park was a nice change from the loud and frantic pace of Anyang. Here it was quiet, secluded, and green. We first had to climb up a long and winding road just to get to the ‘base’ of the mountain. This part of the trip was so interesting in itself. 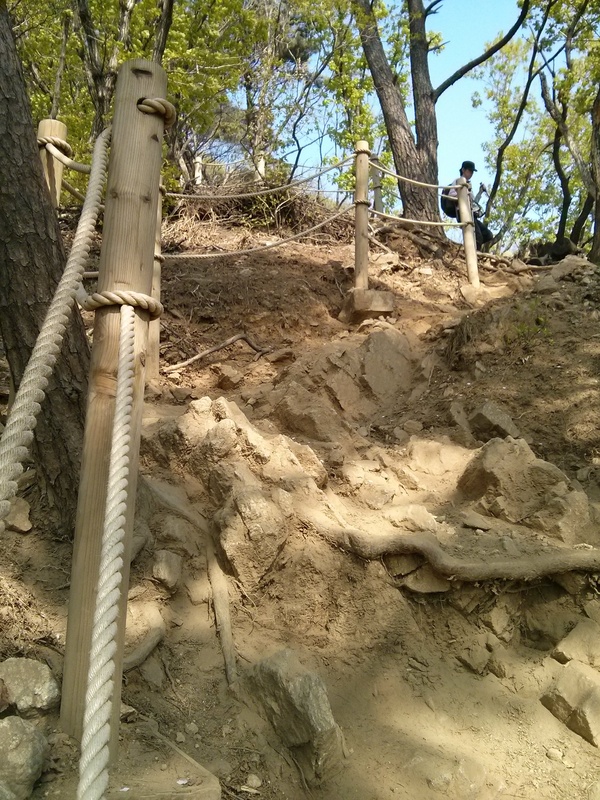 After about a 5 minutes walk uphill we came to the foot of a massive staircase leading to a Buddhist temple. The grounds were colorful and felt like true Korean culture. We were on the side of a mountain, walking between intricately decorated structures, hundreds of statues of Buddha and colorful lanterns. Below are some of the photos from our first stop up the mountain. After our peaceful stop at the temple it was time to hike a mountain! We briefly looked at a map and determined we would take shorter route, which, as it logically turned out, was very steep. In hindsight, we should have taken a picture of the map, but more on that later. We set off on a path that no one seemed to be climbing,. For nearly the entire climb we only passed people descending the mountain, usually in full gear and some even blasting little portable radios. 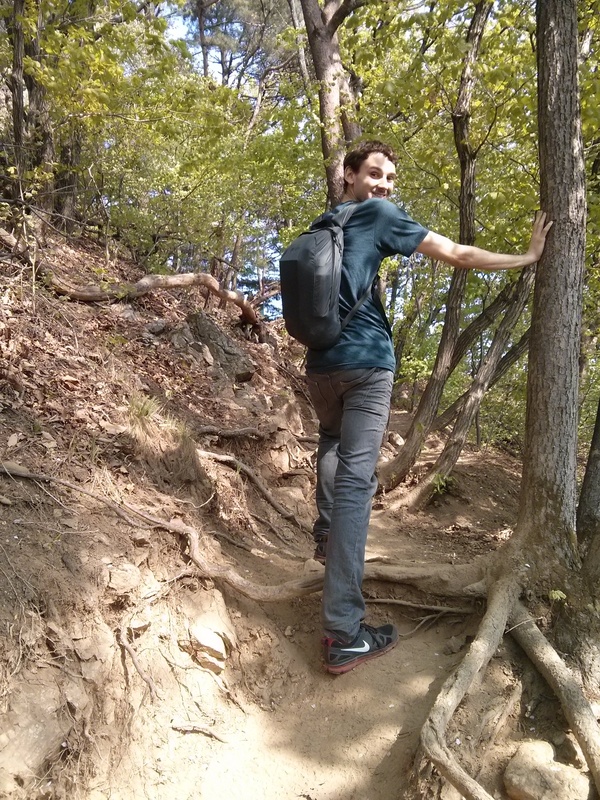 We were never really ‘climbing’ per se, but it did include some incredibly steep trails. We laughed at all the people with their walking sticks before, but now seeing the trails it all made sense. The climb started off easy enough. 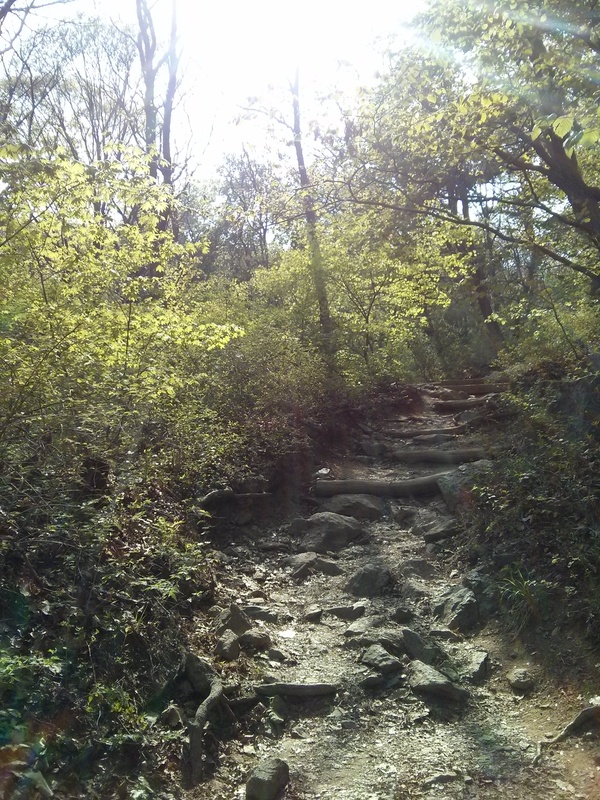 The trails were wide and had a gentle slope. There were even steps in places. But it soon became steeper, and narrower. This was well worth it though. Although a little hazy (as usual) we were treated with great views of the surrounding mountains and Seoul Land Theme Park. Here is a view we enjoyed form a lookout near the peak. We must have passed 3 areas that we thought would be the peak but only turn out to be a flat clearing before another steep climb. Eventually we made it to the top though. It was marked with a large carved stone with Korean writing and a height marker. 545m! We more or less climbed the equivalent of the CN Tower (553m total height) on this day! At the very top there was a little shop where you could buy food and drinks and some tables. It wasn’t very crowed at all – maybe 7 people in total. Getting up was the easy part – all we had to do was follow the paths that went higher. Now that we were at the top, we had multiple choices for our descent. We had planned to take a longer route back to the temple but with no map we were at the whim of the vague Korean signage. Honestly, who doesn’t put trail maps ON THE TRAILS? We began our trip downwards in the opposite direction we came up and figured the worse we could do was end up on the other side of the mountain in Seoul. As we went down our view changed from mountains to a city, which we thought was Seoul. Apparently. not. We descended much more quickly than we went up, but our knees and legs could feel it. With every step down our legs had to rebound against the pressure of a big step. Imagine the feeling of snowboarding or skiing down a very large hill for 10 minutes non-stop. Well we rushed down the mountain and after a couple randomly chosen fork-in-the-roads, we came to a small little town on the mountain side. 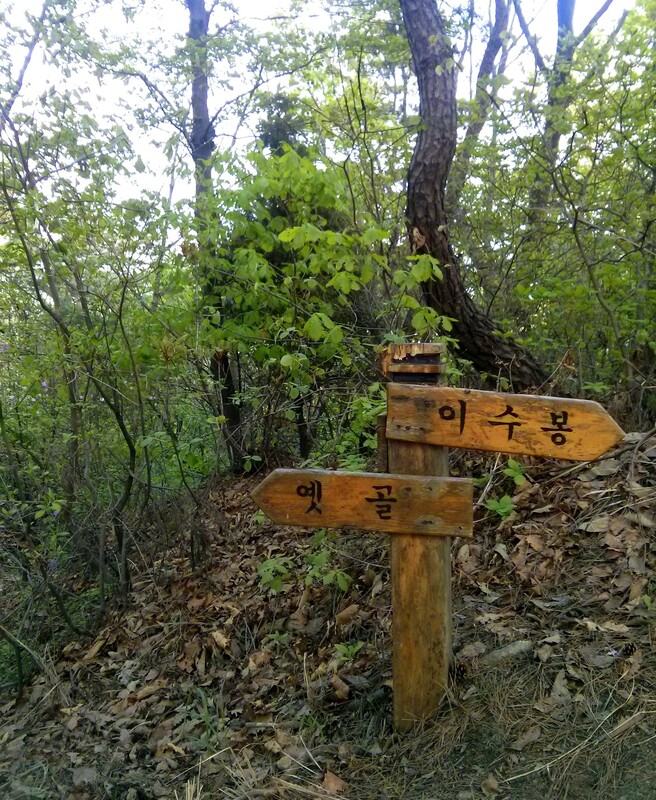 Thankfully we had phones with GPS and google maps, the latter of which is completely integraterd with Korean transit. It turns out we completely went down the opposite side of the mountain and ended up in a small little town just outside of Seoul’s boundaries. We walked around for a bit and found a bus stop which took us to a nearby subway station. 3 subways transfers and 1 and a half hours later we were back in familiar territory – and it was dark out! On a side note, the subway we took must have been one of the newest one’s built. The station was immaculate and clean-room white, and our subway was completely driverless. We scooted to the front window for a view of the tunnel. It was all very satisfying for a couple of transits advocates 😛 We finally had made it back to our city dusty, tired and hungry, but in one piece. It was so late we didn’t have time to cook our special pork dinner we had planned for Easter, so instead we went out for steamed pork, which was delicious. So what did you do on your Easter? The Great Easter Hike!! !….what no Easter egg hunt? Seriously, pics are inviting & I would do that hike in a heart beat. It was quite the adventure. I can only imagine how much fun it is to just go with the flow and figure things out as you go. Sounds like the transit there rocks! I feel as though I just went on a tour! So beautifully written! Thanks!